Stressed out? Swimming in a sea of screens? Worried about our beloved, endangered earth yet uncertain how to work for change? If this sounds familiar, you're not alone. In this intelligent guide to mindfulness in the digital age, writer and teacher Amy Weldon describes how practicing life as an artist can help you wake yourself up and take back control of your attention, your money, your time, and the health of our society and our planet. Traveling from farm to protest march to classroom, and engaging a range of thinkers from Hannah Arendt to George Orwell, John Keats, and Henry David Thoreau, The Hands-On Life is a book for students and for everyone who dreams of building a better world. ""In this era of political assaults on the sciences, humanities, and arts, it is bracing to read Amy Weldon's feisty, full-throated defense of the human capacity for learning. As a teacher, she celebrates the awakening of imagination and conscience in students. . . . Readers who are seeking a right path through thickets of technology, money-worship, and consumerism will find here a wise and appealing guide."" --Scott Russell Sanders, Distinguished Professor, Department of English, Indiana University ""Amy Weldon's new book The Hands-On Life is a tour de force. It skillfully interweaves the personal with the political, and the pedagogical with the poetic. . . . In so doing, she helps every reader--student, teacher, community leader, or gardener--better navigate the 'choppy waters of fear and hope in which we all bob.' Read this book--you can't afford not to."" 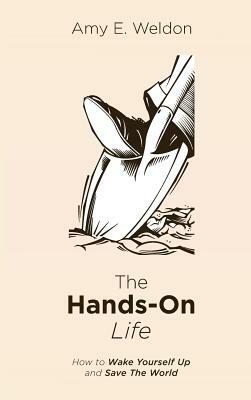 --Jacqueline Bussie, Professor, Director of the Forum on Faith and Life, Concordia College-Moorhead ""In this age of distraction, commodification, and misinformation, Amy Weldon's The Hands-On Life is a brisk, wise, necessary tonic. It woke me right up. It'll wake you up to. Read it. Share it. Try--and I'll try with you--to live it."" --Joe Wilkins, Author of The Mountain and the Fathers and When We Were Birds Amy E. Weldon is Associate Professor of English at Luther College in Decorah, Iowa.